This Easter Weekend - Thursday 24th - Monday 28th March - Yard Sale Pizza are collaborating with White Men Can't Jerk for a special one-off pizza to be sold from their shop at 105 Lower Clapton Road. The 'Just Jerkin' pizza will have WMCJ's BBQ Jerk Chicken, Jerk Gravy base, and much more and comes in a 12" and 18" size. Definitely one to try! "Yard Sale Pizza is back for another one of it’s unmissable ‘Love In’s’, collaborating with east London’s jerk chicken aficionados, White Men Can’t Jerk, for a one-off jerk pizza. Following the success of previous pizza specials, the Burns Night haggis pizza with Deeney’s and the 1st birthday pastrami calzone with Monty’s Deli, the ‘Just Jerkin’ will be served from Thursday 24th March through to Bank Holiday Monday 28th March. Known for popping up at party pubs, festival food quarters and the London Jerk Cook Off, White Men Can’t Jerk share a passion for bold flavour combinations, making them ripe for a ‘Love In’ around the Yard Sale Pizza oven. 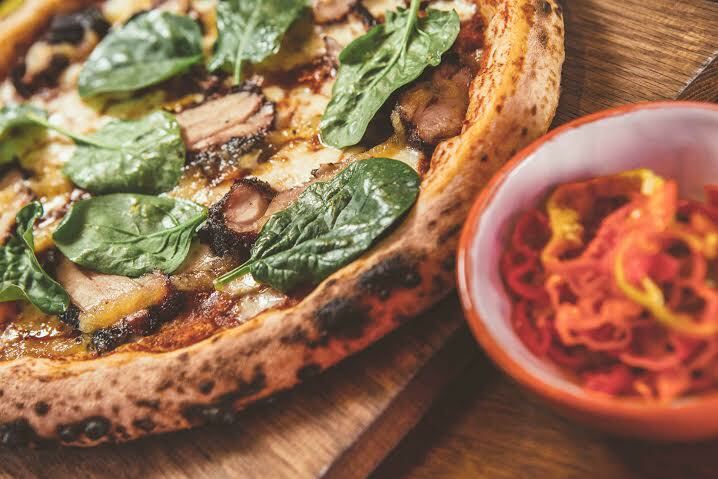 So... you might want a dribble bib for this bit...Thin slices of WMCJ’s signature smokey BBQ jerk chicken are laid out on a jerk gravy base (mixed with a little of Yard Sale’s slow cooked tomato sauce), fior di latte mozzarella, callaloo leaf, and pineapple scotch bonnet jam. The pizza will be served with optional WMCJ house pickled scotch bonnet peppers for those who want to turn it up a notch! Having picked up the Time Out Love London Award for Best Hackney restaurant in 2015, Yard Sale continue to win over pizza fans with their distinct handmade stone baked pizzas made from double fermented dough for mature bubbly crusts, and high quality ingredients that are made up in both 12” and super size 18” for sharing (or not). 12” / 18” stone-baked pizza topped with smokey BBQ jerk chicken, a jerk gravy base, fior di latte mozzarella, callaloo leaf, and pineapple scotch bonnet jam."